I realize it’s a little early for dragging the Fall decorations out, but if you live in Florida by the time September rolls around you are more than ready for Fall to arrive . . . . if only in your dreams. I wasn’t always a Floridian. No, I grew up in Southern Maryland where the change in season was something you eagerly looked forward to when the calendar advanced to September. The cooler temperatures, changing color of the leaves, hay rides, bonfires and of course, pumpkin carving. Living in Florida is different. The leaves don’t change and our cooler weather doesn’t usually arrive until December if we’re lucky. And, you don’t dare carve a real pumpkin because it will rot before Halloween even arrives. But, we still decorate for Fall to remind ourselves that the season is changing even if Mother Nature hasn’t acknowledged the fact. Window box display for Fall. I am obsessed with white pumpkins this season. I think they became popular a couple of years ago, but I didn’t really pay much attention to them till I started seeing all the beautiful photos on Pinterest. They really are quite beautiful and can be used in both formal, elegant displays and more traditional rustic arrangements. White pumpkins and gourds with bittersweet centerpiece. Examples of more elegant displays for interior use. Grab a shabby chic white chair and add pumpkins ~ perfect for your front porch. I’m particularly fond of using an urn for your pumpkin display. What a lovely centerpiece this makes. Thank you so much for stopping by. I hope you enjoyed your visit. I love hearing from you and sincerely appreciate your comments and all those who follow my blog. Please visit my Facebook page for more current goings on for my garden whimsies. Oh, good gigantic smile o’ the brown earth, this Autumn morning! Hello friends. I’d like to introduce you to one of my favorite gardening magazines, Flea Market Gardens. 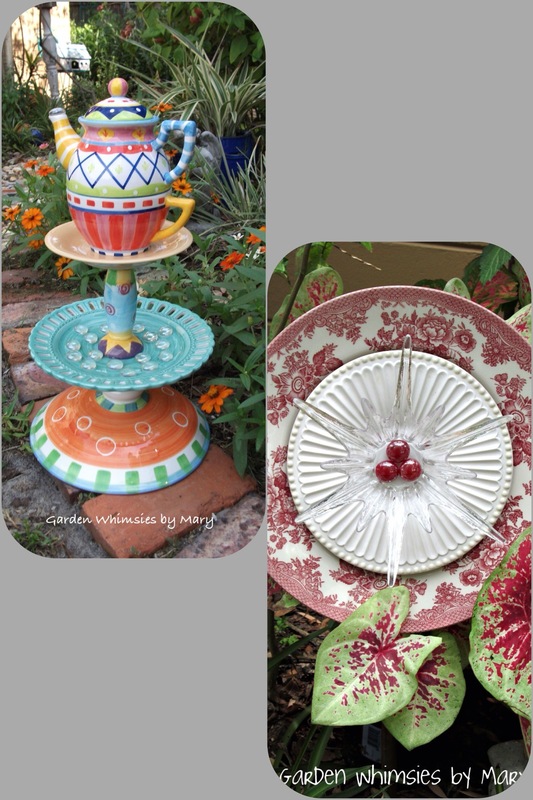 I’m so excited to share with you that my garden whimsies and my garden are featured in the current issue. The charming potting shed on the front cover is my potting shed. I’ll tell you a little more about that later. All of the beautiful photographs on this post were taken by the very talented photographer, Jerry Pavia. I’d like to thank the editors of FMG for bestowing such an honor on me. 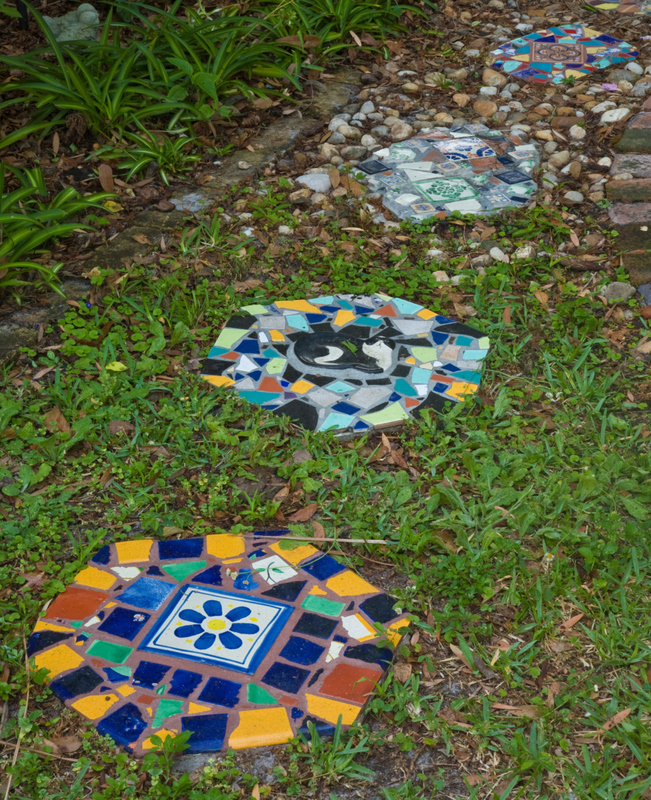 My garden was one of many in the Tampa area Jerry photographed in May 2012. Imagine how surprised I was to find that of all the gardens visited throughout the country, my “repurposed” potting shed was selected to be the cover. My potting shed began it’s life around 25 years ago as our childrens’ playset, built by my wonderful husband. It included swings and a sliding board, even an upper and lower deck for playing. When the children grew up and I discovered my love of gardening, we hit upon the idea the abandoned playset could be transformed into a much needed, functional potting shed for me. 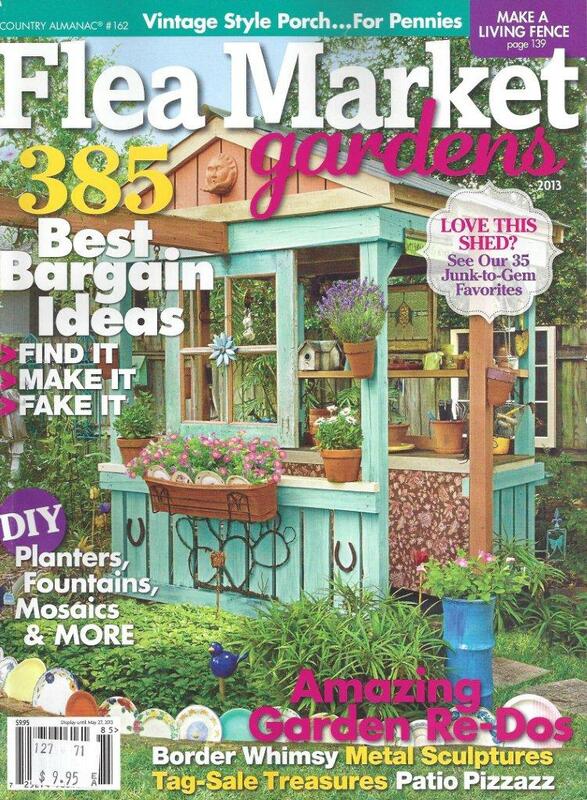 I’m also very honored the magazine featured two of my garden whimsies in this issue. It gives me great joy to rescue unwanted dishes and glassware and transform them into beautiful art for your home and garden. Reduce, reuse, repurpose! 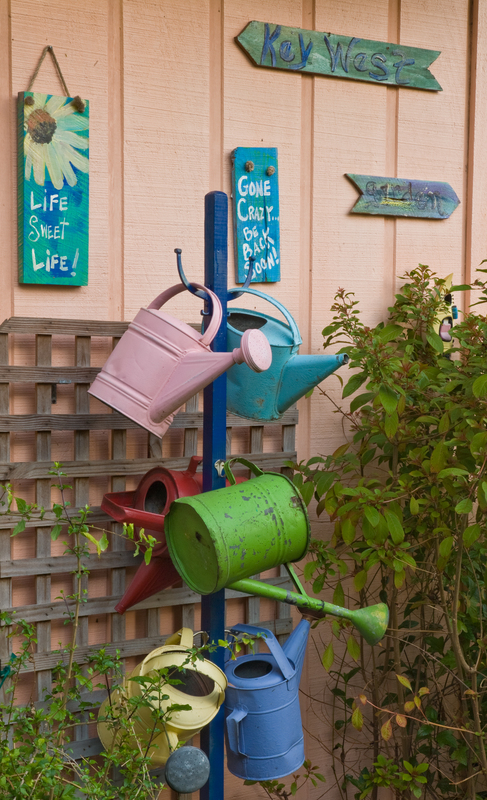 I love accesorizing my garden with all types of fun items. Here are some of the other photos of my garden included in the magazine. Please do not pin or use any of the photos on this post as they are the property of Jerry Pavia, taken for Flea Market Gardens Magazine. 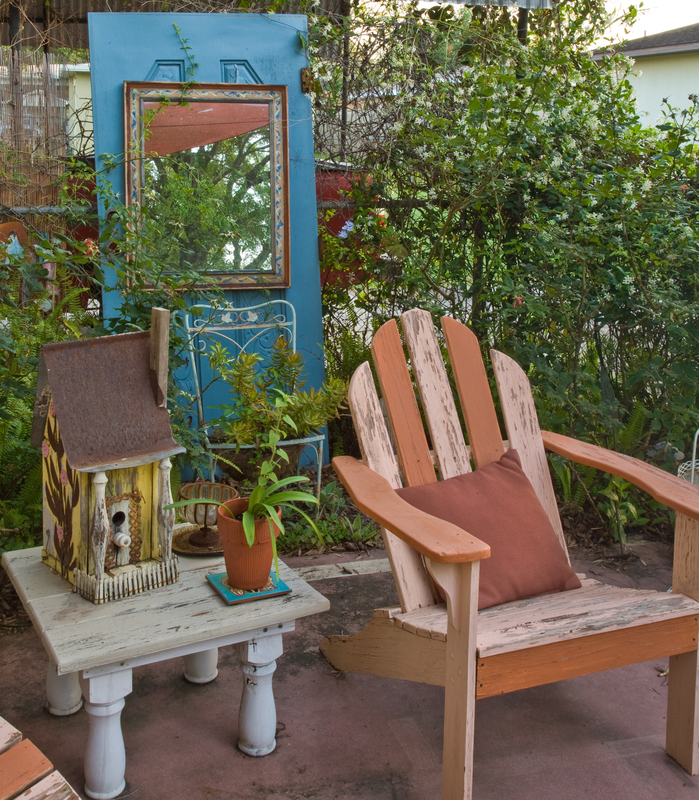 My garden is small, so I love using mirrors in the garden to visually expand the space. One of my Facebook and blogger friends, Erin Houghton with My Painted Garden is also featured in this issue. Erin’s an amazing gardener and artist. I first stumbled on Erin by way of her beautiful garden paintings. Be sure to check out the article on Erin (pgs. 126-133). I so want to visit her California garden. Thank you so much for stopping by. I hope you’ve enjoyed your visit to my garden. I love hearing from you and sincerely appreciate your comments and all those who follow my blog. Please visit my Facebook page for more current goings on for my garden whimsies. As I add the finishing touches to our Christmas tree this year, I began to wonder what style IS our tree? Does your Christmas tree have a style? There are myriad styles to choose from: Vintage, country, Victorian, traditional, contemporary, whimsical and themed to name a few. Are you a lover of all things Victorian? Perhaps a classic tree is more your style . . .
Maybe a beachy theme if you live on the coast . . .
Or maybe pretty in pink . . .
Country trees are very popular . . .
Merry Christmas friends and thanks so much for stopping by to visit. I sincerely appreciate your visits, e-mails and comments. Don’t forgot to follow me on Facebook if you’re not already a fan. I wish you and yours a most blessed and peaceful holiday season and a joyous 2013. Santa Fe is probably my favorite place in the world. Having visited New Mexico and the Santa Fe area many times, I think I could easily live there if I could convince my husband to uproot from his birth town. There’s something magical about New Mexico as most people who’ve been there will tell you. 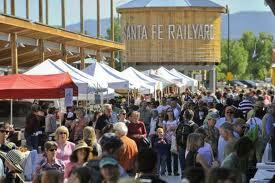 Santa Fe’s draw is something I find hard to explain to those who’ve never been there. The crisp dry air, brilliant blue skies; even the clouds seem different. I feel so at home and filled with a sense of peace when my feet hit the ground and I see the beauty of the Sangre de Cristo Mountains on the horizon. My last visit to the Land of Enchantment was the fall of 2010 with a good friend. It was one of our annual girl’s only weekend getaways. We were both excited to check out the local Santa Fe Farmers Market as it’s rated one of the top in the country by both Travel and Leisure and Sunset Magazine. The market began with a handful of farmers in the late 1960’s and is now New Mexico’s largest farmers’ market with 150+ vendors featuring fresh locally grown produce;flowers; plants; crafts; chiles; fresh honey and sinfully delicious baked goods; soaps; chile peppers roasting before your eyes; locally grown lavender products and chile ristras as far as the eye can see. Being a gardener, I’m always drawn to flowers wherever I travel. I was not disappointed by the array of flowers available; all so beautiful, fresh and colorful. Flowers thrive very well in the high desert area in Northern New Mexico. The market’s artisans are the most delightful and helpful people. You’ll find it very hard to go home empty-handed with the dazzling array of crafts to choose from: jewelry, clothes, wreaths, lavender products, scarves and much for. Perfect mementos from your visit. If you had to describe the colors of your soul what would they be? For artist Mary Mirabal it would be the colors found in a New Mexican sunset. “It’s spiritual” she says describing the view of Santa Fe and it’s surrounding areas. “The light, the sky, the joyous mix of cultures and colors all wound in this beautiful tapestry.” For the piece titled “Colors of my soul” Mirabal wanted to create an abstract piece of art that could help her relive a recent trip to Santa Fe. Once she began on the piece she noticed “the colors just instinctively gathered on my canvas.” The result was an abstract piece of art filled the colors that made Mirabal happy and brought joy to her soul. I am so excited and honored to have 7,000 wonderful Facebook friends. A BIG THANK YOU to all the wonderful fans who support and encourage me in the creative process. In honor of reaching the 7,000 mark I am hosting a giveaway for a $25.00 gift certificate to my Etsy shop. Would you like to be the lucky person to win this gift certificate? “Like” my Facebook page if you haven’t already done so. Click on the gift certificate above to visit my Etsy shop. Find your favorite item, share it here on this blog. Remember to add your email address so I can contact you if you are the lucky winner! This is very, very important. The winner will be selected at random on 12/15/12 (contest ends midnight EST). Simple and easy! Good luck friends. Thanks so much for taking time out of your busy days to visit with me. It truly means the world to me. And, if you’re not already following my blog, I’d love to have you as a new follower. Just click the “Follow” button on the right to get email updates of my posts. 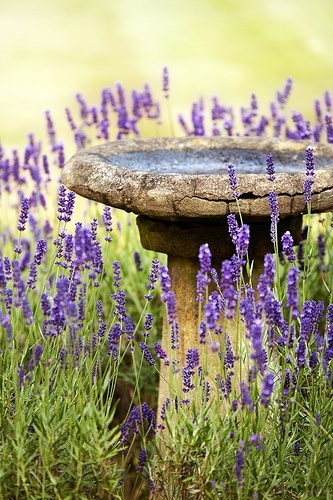 Lavender remains one of the most popular perennials in the home garden, and one of my personal favorites. Many areas of our country are fortunate to have the proper climate necessary to grow this beautiful perennial. Florida unfortunately isn’t one of them. That’s why I love this time of year when our garden shops begin carrying Lavender again for the season. 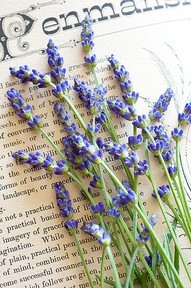 If you’d like to see more lovely lavender inspiration, you can visit my Pinterest page (just click this link). Thanks so much for taking time to visit with me friends. I hope you enjoyed yourself and will come back to see me again. Feel free to bring a friend or two when you come. My latest obsession is the cloche, or bell jar. How is it that I’ve overlooked these simple and charming accessories before now? The French developed the glass cloche (or bell jar) to serve as individual green houses for tender seedlings and young plants in the garden. Their purpose was to protect an early garden plant from harsh weather elements. They come in various shapes and sizes, but the most popular is probably the bell shaped cloche. Not only functional, cloches make wonderful accents for your home and garden. Use them as a food cover for your next gathering, highlight beautiful flowers and fruits indoors, showcase your favorite collectibles, or use during the holidays with your favorite keepsakes. They are almost magical, and so much fun to arrange and rearrange. Why not have several? I acquired my first cloche this week from one of my favorite garden shops, Annie’s Garden Shed in Lutz, Florida. They’re selling like hotcakes at Annie’s and now you know why. Haven’t decided what to fill mine with yet . . . oh the endless possibilities. But, you can be sure this won’t be my last one. Trying to get into the Fall spirit can certainly be a challenge for most Floridians. Since Mother Nature doesn’t bless us with cooler temps until December – and sometimes even later – we must create our own Fall. How do we do it? By going all out decorating our gardens and homes. We can’t put on sweaters and go leaf watching, but we can go to a pumpkin patch and stock up on gourds galore. This is a little corner in my front yard garden that changes seasonally. My vintage bicycle stays year round and provides a wonderful backdrop for my container garden. Just change out the usual annuals with some silk Fall colored flowers, craft pumpkins and some straw and voila ~ it’s now Fall! Also in the front garden is my yellow garden bench, a gift from my children last Christmas. 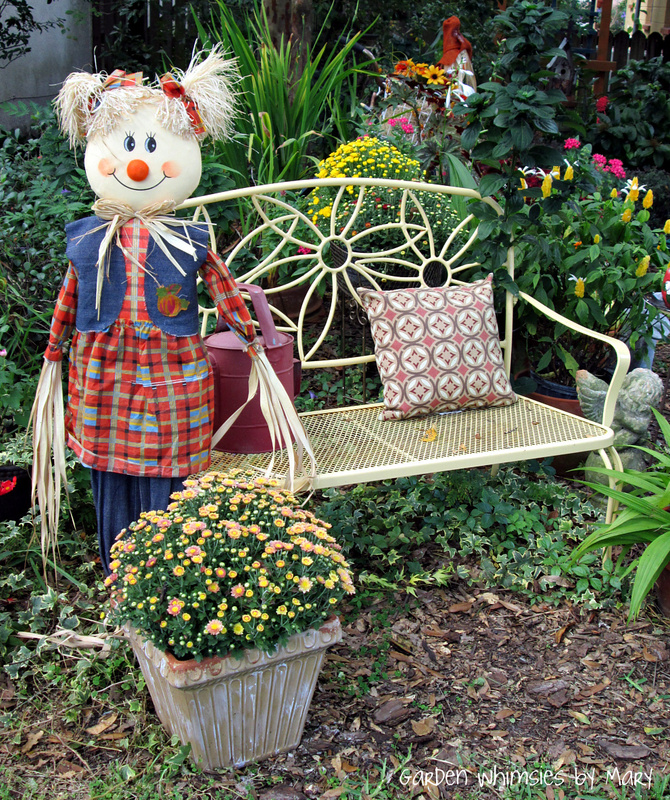 Add some potted mums and another scarecrow and we’re all set to welcome visitors. 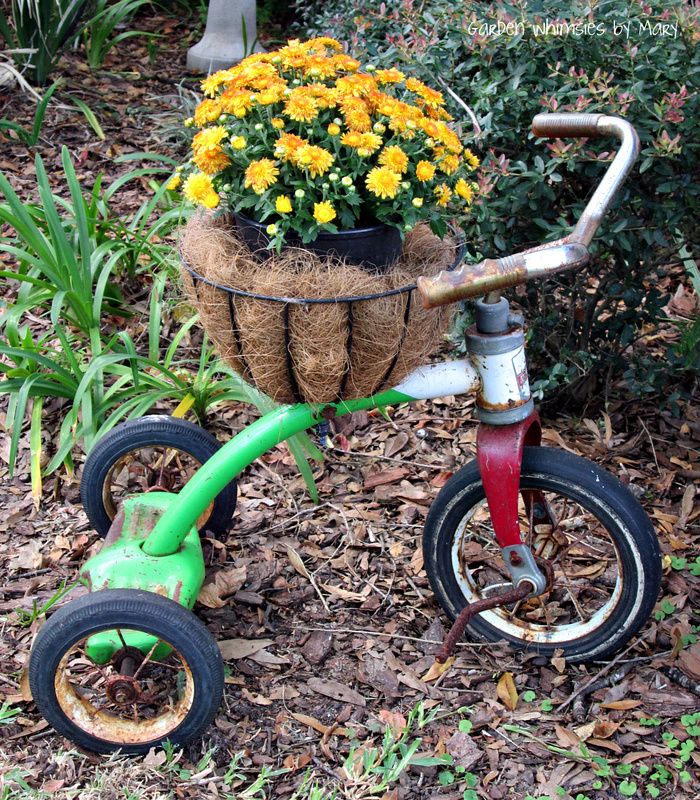 Even my prize vintage trike (found on Etsy) gets in the Fall swing with a pot of beautiful mums. It’s still too warm for hot chocolate and roasting marshmallows, but this is Fall in Florida. So, until I’m able to make a trip back north to view the change of season in person, I’ll be a regular visitor to Pinterest to get my daily dose of the gorgeous Fall foliage so many of you have graciously pinned. Designing fall themed garden whimsies also helps me “get my Fall on”. 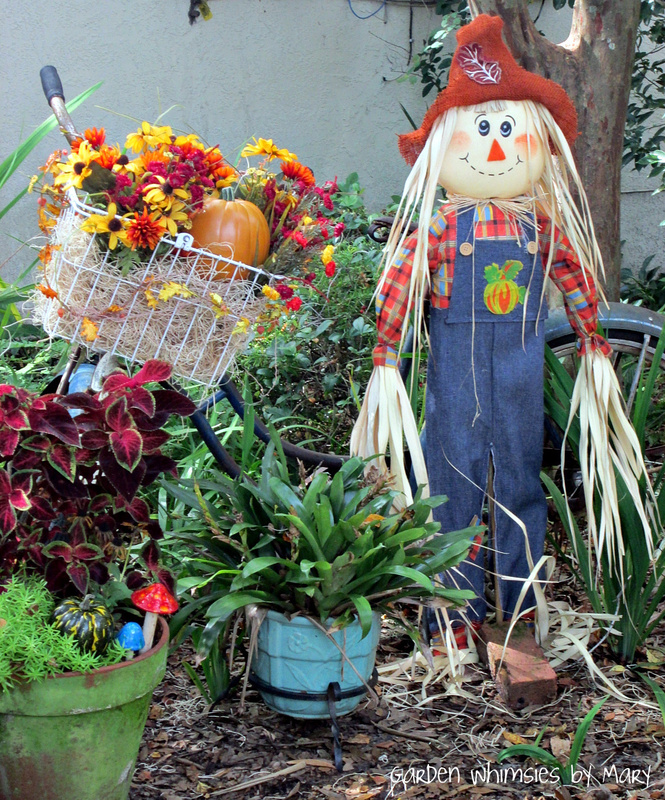 Here are a couple of my new garden totem ~ centerpieces perfect for your Fall entertaining. You can find these and my other garden whimsies in my online Etsy shop. Thank you so much for taking time to visit with me friends. I invite you to visit me also on Facebook where I share tips and pics on things garden related. I’m an amateur gardener and self taught “artist” of garden art who loves to share and inspire other garden lovers. You’re welcome to follow along on my journey. Autumn is my most favorite season of the year. It brings back so many wonderful childhood memories of our home in Southern Maryland. We moved to Florida in 1975 and I love the Sunshine State. It’s only at this time of year that I become homesick for what I used to enjoy as a child. Fall was always a busy time of year with school starting, trick or treating at Halloween, raking the gorgeous leaves when they fell from the trees. And of course you had to jump in the leaf piles because it was just too tempting. A walk down to the creek amongst the changing leaves was a weekly ritual. And then there was the trip to the pumpkin patch to select just the right pumpkin for carving. Hay rides and bonfires complete with roasted marshmallows and smores. I really appreciate the cooler weather now as well. I miss wearing sweaters and sweatshirts this time of year. I envy those of you who live in those parts of our beautiful country where you can enjoy this most amazing transformation of nature. I hope you’ll get out and take advantage of all the wonders that Mother Nature provides this time of year. It’s a glorious treat my friends, and not everyone is lucky enough to see it live and in person. 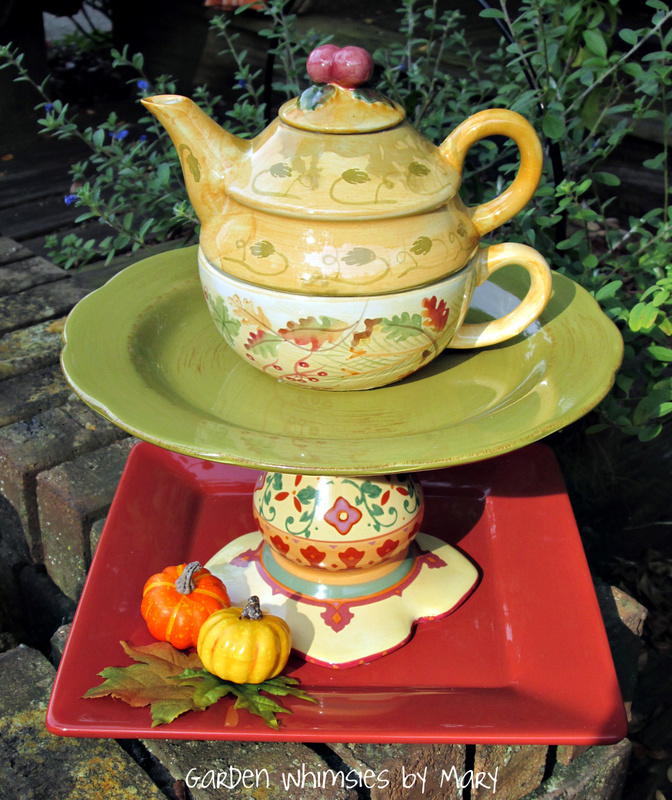 I’ve designed several Autumn-themed garden whimsies to help get me in the Fall mood. 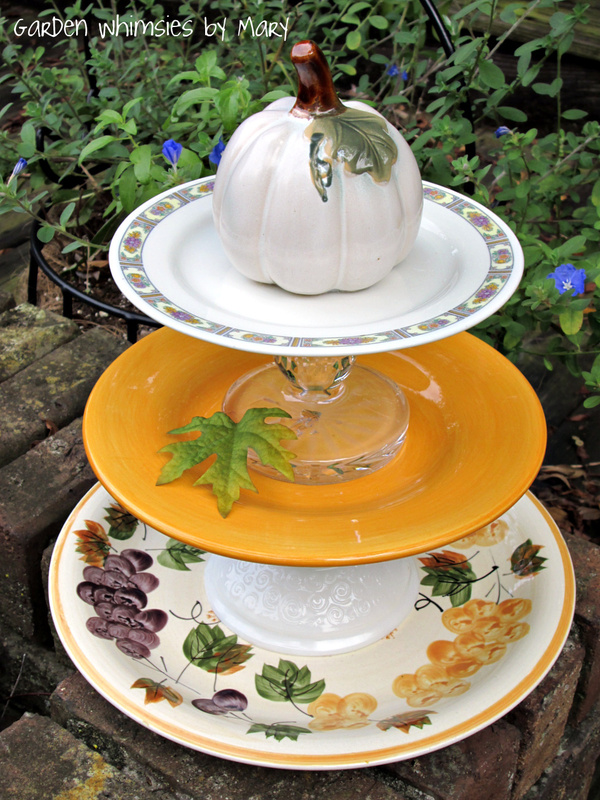 They will look lovely on your Fall table setting. Please feel free to visit my Etsy shop at www.gardenwhimsiesbymary.etsy.com to view them. The world's only blog completely dedicated to the art and craft of gardening in miniature.